Wood carving tools should be carefully maintained and stored to protect their surfaces from moisture and their cutting edges from damage. Store tools when they are not in use so that they will not be damaged by edges hitting each other. Sharpen tools before storing them so that they are ready for use again at a moment's notice. It is prudent to lend out wood carving tools only to persons who have the specialized knowledge to take care of these tools. A traditional method of storing wood carving tools is to use a tool roll, which consists of opposite rows of pockets sewed on a piece of material such as green baize, burlap, or canvas. The tool ends and handles are alternated in the pockets so that the tool roll can be easily rolled up. The material of the roll protects the tools from dampness and from each others' cutting edges. Tool rolls are very portable, and they are often placed near work areas where woodcarvers can easily access their tools. However, a tool roll should not be set directly on a work surface. 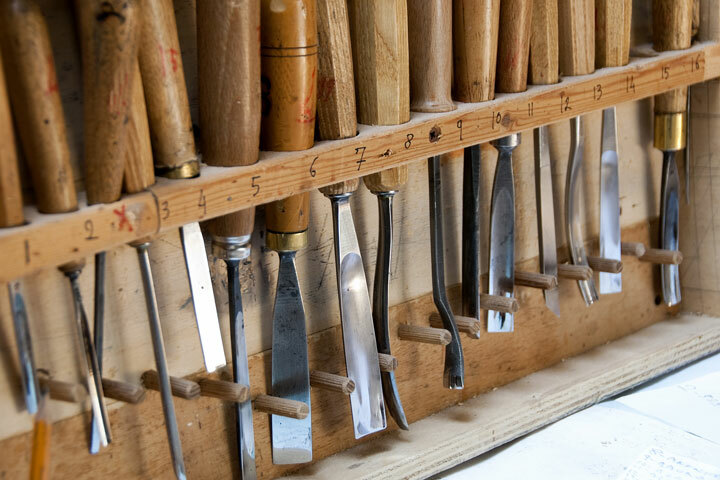 Racks, mounted on a wall over a workbench, are also convenient places to store wood carving tools. The tools hang, inverted, through fabric or leather loops. Another tool storage solution is a shelf drilled with holes and notches through which the tools can be slipped. 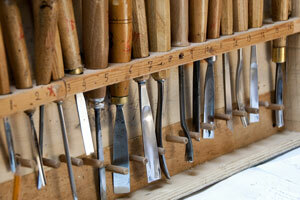 Wood carving tools can also be stored in drawers built into a workbench or in nearby metal tool cabinets on wheels. Cabinet drawer liners can help protect the tool edges from nicks and scratches. Organize the drawers by tool shape or use, and label the drawers. If you intend to store wood carving tools for extended periods, wipe them with oil before storing them, so that they won't rust. While using wood carving tools, ensure that they are easily accessible, and don't clutter your work area with too many tools. Honed tool edges are somewhat delicate, so don't allow tools to hit metal parts or fall on the floor. Metal clamps, carver's screws, or metal rulers can come in contact with the cutting edges and damage them. If a tool edge is accidentally damaged despite careful use, repair the edge right away so that the tool will be ready for use again. Good tool care habits may seem onerous, but they will facilitate your wood carving experience, making it more efficient and enjoyable.